One of the highest flying birds in the world, the bar-headed goose flies above the Himalayan Mountains when it migrates, at heights that may reach 30,000 feet. While more study is needed about this bird's unique migration and the physical adaptations that make it capable of surviving such thin air and cold temperatures, there is no denying these geese are top-notch migrants. Markings: Genders are similar though males are slightly larger than females. The white head is marked with a pair of U-shaped bands crossing the nape, and the upper band that starts behind the eyes is thicker than the lower band. The neck is brownish-gray with a white vertical stripe down each side. The body is grayish above and brownish below, darkest near the legs, though some minor white barring may show both above and below. The lowest part of the abdomen and the undertail coverts are white. The primary feathers are black, and the tail is a light gray-brown. In flight, the dark primary and secondary feathers create a thick, black trailing edge to the wing. The legs and webbed feet are bright orange, and the eyes are dark. Juveniles are similar to adults but generally duller overall, with greenish-yellow bill, legs and feet. Young birds also lack the distinctive head bars, but instead have a black cap on the head. These geese prefer freshwater habitats such as bogs, open marshes, marshy lakes or river wetlands, as well as wet grassy fields or flooded agricultural areas. During the breeding season, they can be found in appropriate habitats in Mongolia, western China, Kyrgyzstan, eastern Afghanistan and northeastern Pakistan. In winter, bar-headed geese migrate directly across the mountains to their wintering range in central Pakistan, India, Myanmar, Nepal and southern China, generally favoring lowland areas in winter. These birds are part of exotic waterfowl collections throughout the world, including in zoos and aviaries. Some feral populations have been established, most notably in Spain, Belgium and Finland, but regular escapee sightings are also recorded in Canada and the United Kingdom. Rare escapees may be seen nearly anywhere. These geese have a low honking call they use almost continuously in flight. On land, softer calls or small trills can occasionally be heard. These are gregarious birds that gather in large flocks and will mix with other waterfowl, particularly other types of geese. They are powerful fliers and have larger, more efficient lungs than many other bird species, adaptations that ornithologists believe are essential for their demanding, high-altitude migration. While migrating, they typically form V-shaped or J-shaped formations, with lead geese falling back when exhausted. On land, they walk well and graze continually. These are monogamous geese that may mate for life, though there are recorded occasions of polygamy when females significantly outnumbers males on the breeding grounds. The nest is a shallow scrape lined with down, but occasionally bar-headed geese will nest in trees. The eggs are plain, dull white or a pale buff, and there are 3-8 eggs in a typical brood. Young females may lay their eggs in an older, more established female's nest, though such parasitic eggs rarely hatch. The female parent incubates the eggs for 27-30 days, and the precocial goslings are ready to leave the nest within a day or two of hatching. Both parents guard and guide the chicks, which are capable of their first flights at 53-55 days old, but are not fully independent until 65-80 days after hatching. Juvenile birds typically stay in a loose family group throughout the winter and only venture off on their own after returning to their breeding grounds the following spring. Only one brood is raised each year. These geese are not typical backyard birds, but may visit backyards in suitable areas where ground-feeding stations are available, particularly if grain or cracked corn is available. Backyard visitors are more likely to be feral or escapee geese rather than wild individuals. 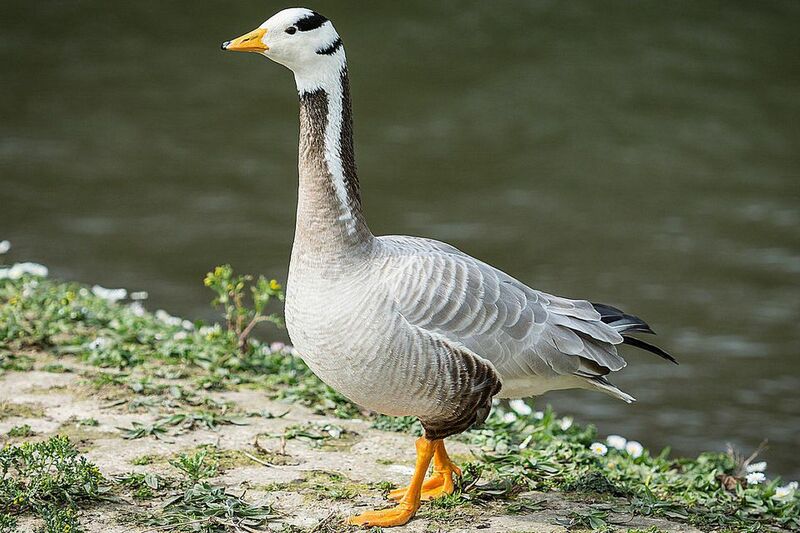 Bar-headed geese are not considered threatened or endangered, though they are susceptible to habitat loss and persecution from farmers where large flocks may be damaging grain crops. In some areas, these geese are hunted, and their eggs may be collected for food. These geese are particularly vulnerable to avian influenza, and it is feared that they may be able to transmit the disease to humans either through direct contact or in their feces.